In recent months I have often been asked about the meaning of the Wyrd symbol which has been part of a number of workshops, artworks and events. This is a very powerful symbol which represents many, many things. I was initially drawn to it as it looked like a weaving, a meshing – something which kept coming up in conversations with a number of friends and collaborators. It certainly was highly symbolic of my journey – my desire to link together my worlds, of art, technology, public service, community activism and collaboration across these realms. It also represented a deep connection to the earth and our destiny. During my time in Norway I have had the great privilege of learning more about the runes and especially the Wyrd. My teachers are experts in Norse culture and their knowledge is expansive on the subject of Norse cosmology and spirituality. One of my teachers, Tyr Neilson is one of the co-authors of a remake of the Hávamál: the sayings of Odin text. For a long time it seemed that there was absolutely no way to see the original vellum Hávamál manuscript, as it is heavily guarded and only very few have been allowed to photograph it. Eventually Tyr and Bente received a mail from the institute that holds the manuscript, saying that they understood the importance of the work on this book. It was therefore granted an exclusive audience with the original manuscript from the year 1270. Photos had to be taken without a flash in a rather dark room at a museum in Reykjavik. The Wyrd is a symbol for Yggdrasil, the World Tree in Norse Cosmology. It also represents ley lines, the complete Rune Alphabet and more. There is a beautiful folk song about Yggdrasil – the song is called Völuspá and is performed by Duivelspack. This is a Nordic folk song created by putting together many parts of the Norse Hávamál. Hávamál (English pronunciation: /ˈhɑːvəmɑːl/ HAH-və-mahl; “sayings of the high one”) is presented as a single poem in the Codex Regius, a collection of Old Norse poems from the Viking age. The poem, itself a combination of different poems, is largely gnomic, presenting advice for living, proper conduct and wisdom. The verses are attributed to Odin; the implicit attribution to Odin facilitated the accretion of various mythological material also dealing with Odin. That fall on the dale! Of the children of time (‘the children of man’). This poem also refers to the creation of the Runes and the fates as written by the Norns – they scored wood. 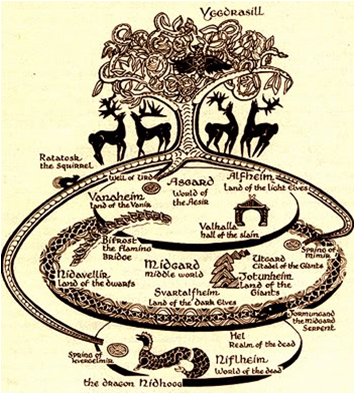 The story and many layers of meaning of Yggdrasil are very rich and connect to many other parts of the Norse way of the world. This is definitely an area I am finding fascinating in regards to the use of words and the complexity of relationships and meanings. As mentioned earlier, the Wyrd is already a concept which carries many connected layers. The word itself is defined as the precursor to the English word ‘weird’ which is interesting but only covers a very small aspect of the meaning. Other connections prevail – the connection to the well at the base of Yggdrasil – Urd (or Urdr in the Völuspá). Every day the Norns collect water from the well – Urdh is also the name of one of the Norns – fate. Ur also means water. In Old Norse, Yggdrasil is called Mimameidr. This giant tree supports the Universe. How Yggdrasil came to existence is not entirely clear, but according to most Norse mythology researchers the sacred Tree of Life grew out of a well called Urd. 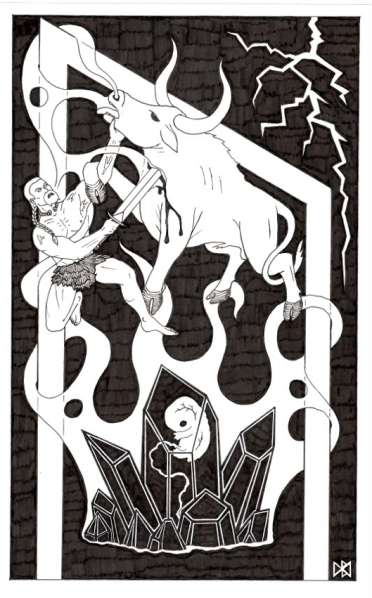 The name itself comes from Yggr, meaning “ The Terrible One”, a name frequently given to Norse god Odin. For the well, the name “Urd” meant “destiny.” Both names can be linked to the Norsemens’ concepts of time. The Well of Urd depicts a “reservoir of completed or ongoing actions that nourish the tree and influence its growth. Yggdrasil, in turn, corresponds to the present tense, that which is being actualized here and now… The Well of Urd and its waters nourish the tree and the water cycle expresses a circular passage of time. The well, which corresponds to the past, influences the growth of the tree, which corresponds to the present. However, unlike in our modern, linear conception of time, the present then returns to the past even retroactively changing it! Something else that fascinates me is the connections with other cultures. When we were in Turkey we learnt that the Vikings and the Ottoman Empire traded and exchanges many aspects of culture – bathing rituals, also the connection to the Tree of Life. The above tapestry’s depiction of the tree is a symbol I have seen in weaving and jewellery in Turkey. Given that the well of Urd is the source of all life, it makes sense that this word also has yet another meaning – God, specially Thor – but in my mind this is a limited view. Invoking Uruz power can see you through to extraordinary ends. Uruz is interesting because of its momentum full throttle can deliver mighty successes. If you enlist the aid of Uruz it can dull doubts that might otherwise thwart your plans. Uruz is the wild, sure, and passionate True Will, the grit that underlies existence. Invoke Uruz to seek who and what and why and how you really are, all bullcrap and self-doubt aside. Uruz shows the seeker what he is made of. It is a rune that I heavily associate with rites of passage into greater echelons of might. 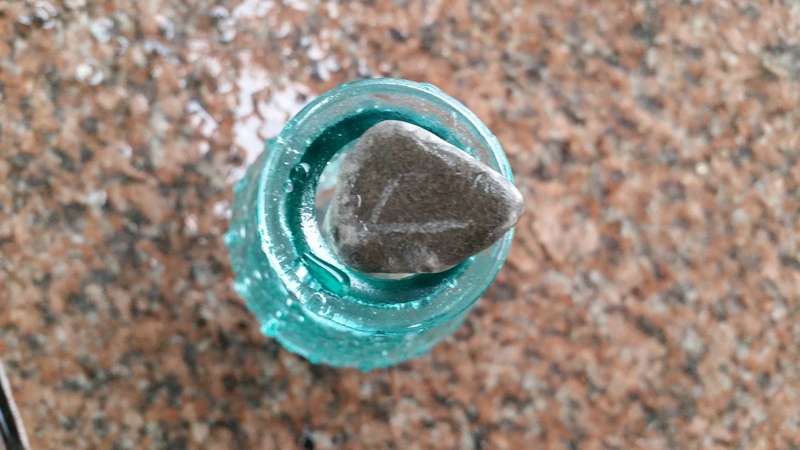 By some strange coincidence – this was the rune I drew in August for the Loving Waters full moon ceremony. The study of Norse cosmology opens up for me a deep connection to an ancient past, one that resonates through the realms of ancestors, of a love of the land, the connectedness of all things and beliefs that honour self reliance, humility and kindness. This post will be expanded on over time as my knowledge and understanding grows. The Norns are also a fascinating area of research – the three fates, the three graces, the three ages of women – perhaps I will write more at a later date. This post about the Norns and the Fates is a good start. This post from Norse Mythology provides an excellent summary of Yggdrasil and the well of Urd. 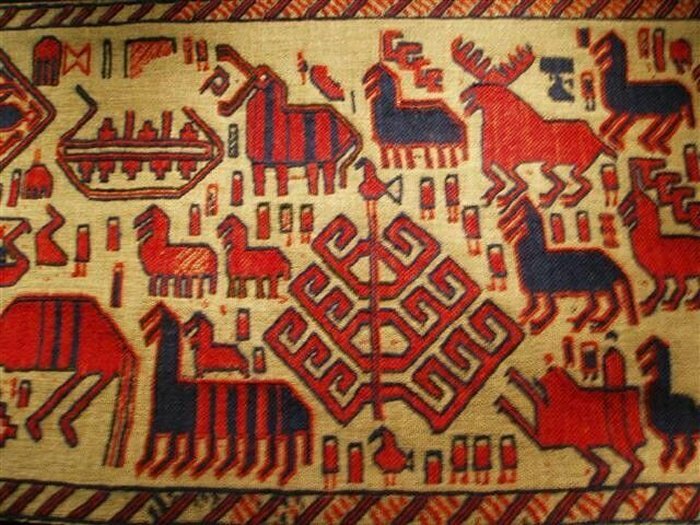 Nordic Life Blog has a very detailed summary of Urd/Uruz. Rune Secrets has a great summary of Uruz.